Werner Herzog has a unique approach to filmmaking, one that he’s proven surprisingly willing to share. The Bad Lieutenant: Port Of Call New Orleans and Grizzly Man director recently teamed up with MasterClass to teach the methods to his madness, which apparently include extralegal activities. At least, that’s the part of his syllabus that Herzog shared with Conan O’Brien, who took all of the talk of forgery and the hoodwinking of military officials in stride. 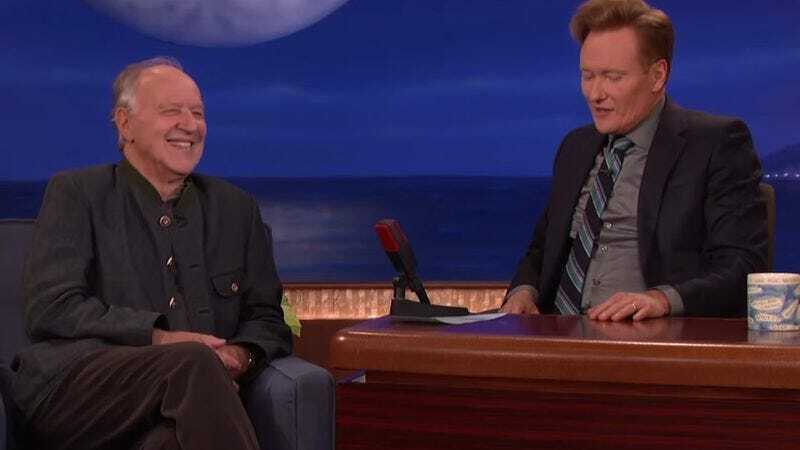 Herzog was on Conan to talk up his latest film, Lo And Behold, Reveries Of The Interconnected World, which examines how the virtual world of the internet has shaped the tangible one. So the fatalistic director naturally discussed the lessons he imparts via T1 lines, including securing financing as well as opening doors, i.e., lock-picking. Herzog also promotes perseverance via forgery when the situation warrants it. Rules are just as meaningless as our existence, after all, and no permit’s going to get in the way of Herzog’s shot.